BHIMRAO Kaviram Kadam of Dhanora Tathod village in Maharashtra’s Washim district is, in more than one way, going back to his farming roots. And so is Pandurang Shende of Brahmankheda in Yavatmal district. They are among 160 farmers across the Vidarbha region who have turned their backs on genetically modified or Bt cotton, which they have been growing for several years and plumped instead for Desi (Indian) cotton varieties. This is a dramatic change and it has been prompted by soaring costs of inputs and poor yields that have made cultivation of Bt cotton hybrids untenable in the extremely harsh, rain-shadow terrain of Vidarbha. It’s here in Vidarbha, notorious as the suicide belt of debt-ridden farmers, that the state has finally stepped in to seek ways of making cotton cultivation sustainable through a productivity improvement programme that marks a clear shift from dependence on high-tech solutions. Leading the initiative is the Central Institute for Cotton Research (CICR), which has put together a package that provides farmers its best varieties of Desi cotton (G arboreum and G herbaceum species) and superior medium and long staple varieties along with an old but discarded technique of cultivation—high-density planting system (HDPS) in which cotton plants are packed tightly together at eight to 10 times the normal rate and planted in rows. HDPS, like the varieties, was used traditionally in Vidarbha until hybrids made their entry in the 1970s and gradually took over the market. As such, the CICR project, which is backed by Maharashtra, marks a return to their roots for the farmers who have overwhelmingly taken to Bt cotton since its debut in 2002. But with Bt cotton failing to live up to its promise of high yields and reduced pesticide use, desperate farmers now appear ready to return to their roots. In Vidarbha, in particular, Bt cotton has proved to be a bitter experience for farmers who were not cautioned that the technology is premised on the availability of irrigation facilities almost absent in the region. Drought is now compounding the problem. Accordingly, the worst soils and the toughest terrain of Vidarbha have been selected for the project. Explains CICR director Keshav Kranthi: “The aim is to find a sustainable solution for Vidarbha farmers. I am convinced this is the way. By October-November when the cotton crop is ready we will know if this is, indeed, the answer for Vidarbha’s crisis.” Initially, 40 villages in eight of Vidarbha’s 11 districts—Akola, Amaravati, Yavatmal, Washim, Chandrapur, Wardha, Buldhana and Nagpur—have been covered in the demonstration projects that are being taken up by Krishi Vigyan Kendras (KVKs) and the Maharashtra Agriculture Department. Total cost: just about Rs 10 lakh for the 64 hectares (ha). The objective: to validate production technologies for rainfed regions of Vidarbha and to establish sustainable yield levels of over 1,800 kg per hectare of seed cotton compared with current yield of just seven to eight quintals. If successful, the project will be widened to parts of Madhya Pradesh, Andhra Pradesh and Odisha with industry linkages. The idea is to meet the surging demand for surgical cotton. CICR is footing the bill for this initiative, which Kranthi is pushing even before getting formal approval. “I felt we couldn’t wait any longer because the situation in Vidarbha is critical,” he told Down To Earth. To make certain that farmers follow HDPS norms scrupulously, CICR has marshalled 17 of its scientists to monitor the project in different locations apart from the complement of KVK and agriculture department officials who are coordinating the pilots. “We are providing all the technological inputs and CICR is taking sole responsibility for the project,” declares Kranthi. The focus is on slashing costs. According to estimates by CICR, input cost (fertiliser, pesticide, growth regulator and weedicide) comes to just Rs 4,525 per acre (0.4 ha) of HDPS compared with at least Rs 10,000 for growing Bt cotton. There are other benefits, too. Zero cost of seed because farmers can reuse their seeds, low outgo on labour because unlike hybrids Desi varieties require much less weeding. 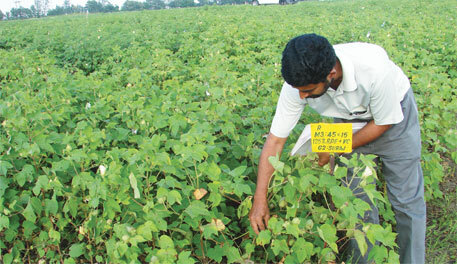 Kranthi is endorsing what a number of agriculture experts have been saying for the past decade: Bt cotton is not suitable at all for rainfed areas. In fact, a 2006 fact-finding survey by the Planning Commission had underscored “the wrong or uninformed choice by the farmers in adopting varieties of seeds which were not suitable for rainfed conditions”. Although packets carried the caution “Best grown in irrigated conditions”, farmers did not pay heed to this as it was in very small letters. “The adviser was the input dealer and the State machinery did not take precautions or measures to warn the farmers,” the report had pointed out. Brazil has the highest productivity among the top six cotton producers in the world with yields of 2,027 kg per ha. India’s yields are less than 500 kg. However, Brazil’s vast cotton fields rely heavily on mechanisation and are assured of high-quality seeds. Although these factors are missing in the Indian context, particularly superior varieties, Dangat is confident the Desi cotton initiative will succeed in Vidarbha. While some farmers’ organisations and activists campaigning for sustainable agriculture have welcomed the Vidarbha initiative, however late in the day it may have come, there is scepticism—anger, too. Kishore Tiwari, president of the Vidarbha Jan Andolan Samiti dismisses the exercise as a pointless undertaking of discredited agencies like CICR, which had promoted Bt cotton of its own. Tiwari has been carrying on an unrelenting campaign for a ban on Bt cotton in Maharashtra because he believes the costly GM technology is responsible for the huge number of farmer suicides in the state, the largest number being from Vidarbha. “Sharad Pawar (agriculture minister) has admitted that the average yield of Bt cotton in dry land areas of Maharashtra is only 125 kg and that’s why farmers who opted for Bt cotton in four million hectares are likely to lose Rs 10,000 crore according to the initial estimate by the government.” Maharashtra had announced a compensation package of Rs 2,000 crore for Bt cotton failure in February. Officials are unwilling to comment on the demand for a ban on Bt cotton but Dangat says Maharashtra is keen to increase the area under Desi and HDPS. CICR, too, is determined to revive the fortunes of Desi cotton which was grown in two million hectares until 2005. Currently, its acreage is less than 100,000 ha, relegated to marginal land although it boasts huge advantages: resistance to sucking pests, immunity to new leaf curl virus and tolerance for moisture stress. But while championing Desi, CICR is also working on compact multi-gene “super Bt cotton” dwarf varieties for HDPS. It is an ambitious network project involving public research institutions and universities and will build on novel genes that have already been discovered but not commercialised.